Harold Urey (1893-1981) was an American physical chemist and winner of the 1934 Nobel Prize in Chemistry. 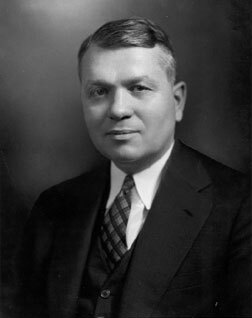 Urey and his team at Columbia began working on uranium isotope separation in 1940, when he was also appointed chairman of an Advisory Committee on Nuclear Research. The next year, Urey became a member of the Uranium Committee and enjoyed broad responsibility over the research program's direction. In 1931, Urey discovered deuterium, a hydrogen isotope which has one proton and neutron (unlike the most common hydrogen isotope, which has no neutrons). For this discovery, Urey received a Nobel Prize in Chemistry in 1934, the third American to do so. Urey also made a number of contributions to the Manhattan Project, including playing a key role in developing the gaseous diffusion method to separate uranium-235 from uranium-238. However, when the choice was made at Oak Ridge to prioritize the method of electromagnetic separation, Urey delegated responsibility to the laboratory's associate heads and devoted his attention to the control of nuclear energy rather than its application. After World War II, Urey joined the Institute for Nuclear Studies at the University of Chicago, where he remained until 1958 before moving to the University of California, San Diego. While at Chicago, he conducted the well-known Miller/Urey experiment about the origins of life, which simulated conditions on the early Earth. The experiment showed that organic compounds like amino acids, which are necessary for cellular life, could easily be formed under such conditions. 1893 Apr 29th Born in Walkerton, Indiana. 1917 Received B.S. in Zoology from University of Montana. 1923 Received Ph.D. in Chemistry from University of California, Berkeley.